The world is a very, very odd place – filled with outrageous stories. A man on a 20-foot unicycle carries an armload of baguettes and a hatbox down a dark alley. Where is he going? What's in the box? A woman in a crocodile jumpsuit argues with a street musician. Why? What are they arguing about? Your best friend finds a small stone icon that pulses with the magic contained within. Wait, what? What does the icon do? What's going on? We want answers. You have answers. Tell us what caused the fight that made the band break up. Draw a picture of an award-winning gingerbread house. Act out the scene where you lead your people back out onto the surface after years in your underground bunker. 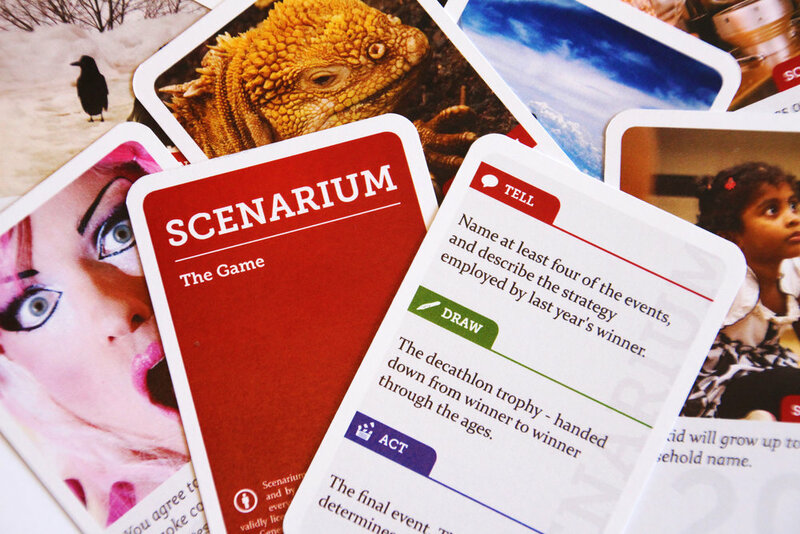 Scenarium is a party game for up to 15 people where teams of two or three (or single brave individuals) are given a photo, a scenario, and a prompt and they compete to see who can spin the best yarn. Challenges are divided into categories: Tell, Draw, and Act. The round begins when the director shows everyone the picture, reads the scenario, and chooses whether the other teams will Tell a story, Draw a picture, or Act out a scene. The teams get a few moments to plan, and then every team takes their turn entertaining the group before the director chooses the winner of the card. The director then passes the deck to the next team and it's their turn to direct. The first player or team to win 5 cards wins the game, but if you want to go longer, shorter, or change teams, or turn it into a very elaborate drinking game, that would be amazing. We love hearing about house rules. Scenarium was developed by Robot Dinosaur Games and by a community of generous creative people everywhere. All of the photos used in Scenarium are validly licensed under the Creative Commons Attribution 2.0 Generic License and we thank all the photographers and their subjects. Robot Dinosaur Games has no desire to violate publicity or privacy rights of individuals and is not responsible for any such violations or other violations of trademarks or copyrights contained in any of the photos.